The Morgellons Research Foundation has said many times that cellulose has been detected in fibers that Morgellons patients found on the skin, or in their wounds. They are also quite interested in tests that showed Agrobacterium in wounds. (Agrobacterium is a bacterium that normally infects plants, but can infect humans with weakened immune systems, particularly with chronic skin trauma). Agrobacterium is one of number of species that produce microbial cellulose. Of course this is of interest, since some fibers tested have been shown to contain cellulose. 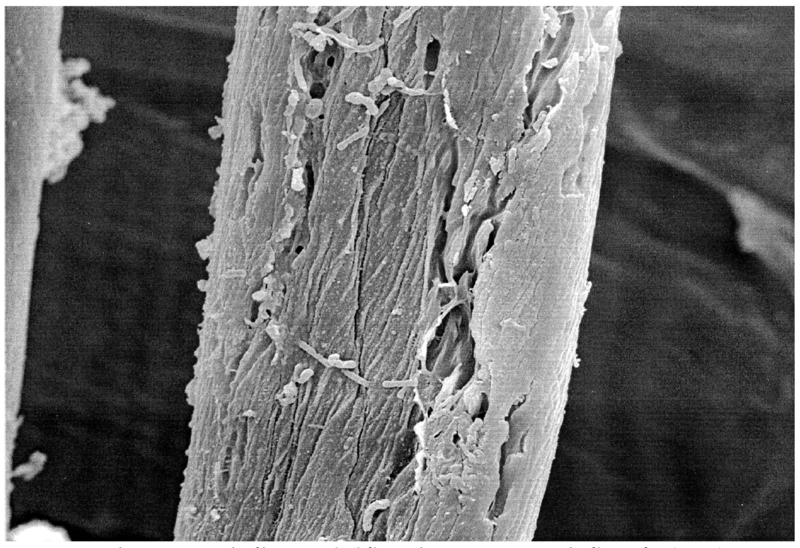 Could those fibers be microbial cellulose from Agrobacterium? 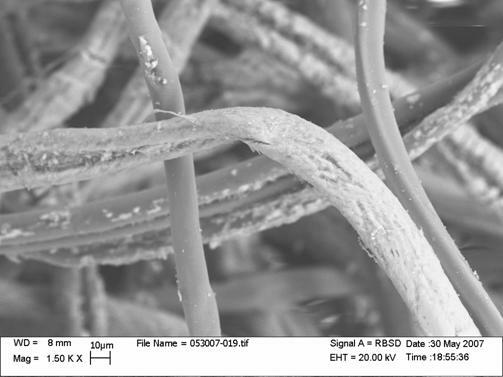 Note the scale in the bottom left, 10µm, meaning the smooth fibers are about 10-15µm across. At first glance it looks plausible that it might be the same thing. But look at the scale in the bottom right (click on the photo to zoom in). 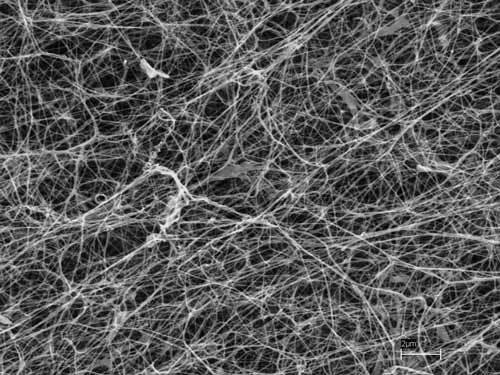 It’s 2µm, meaning the microbial cellulose fibers are about 0.1µm across. 1/100th the size of the Morgellons fibers. Here’s what the microbial cellulose fibers would look like at the same scale as the Morgellons fibers. 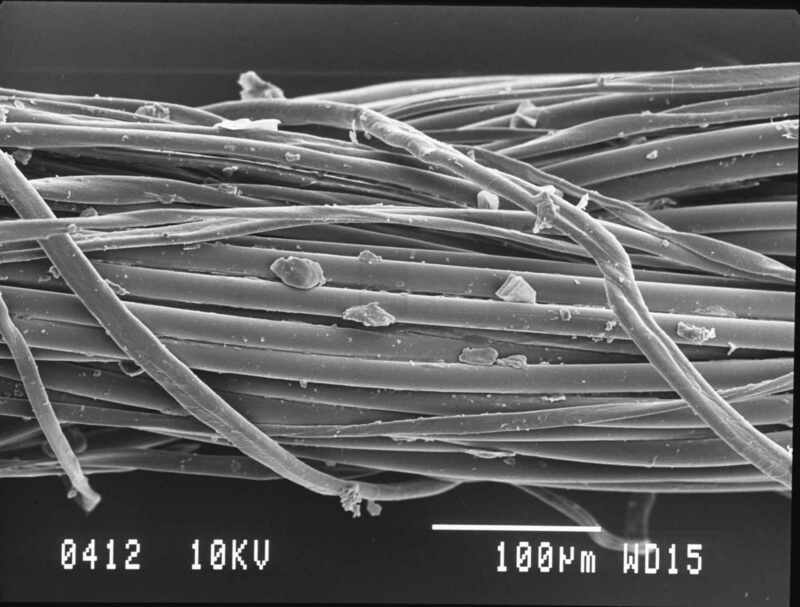 So, no, these “Morgellons” fibers do not in any way resemble microbial cellulose from Agrobactrium. In fact, they look exactly like cotton. They are made of the same thing as cotton. Cotton is in nearly all bandages and dressings, towels, clothes, furniture and household dust. Cotton fibers are everywhere. 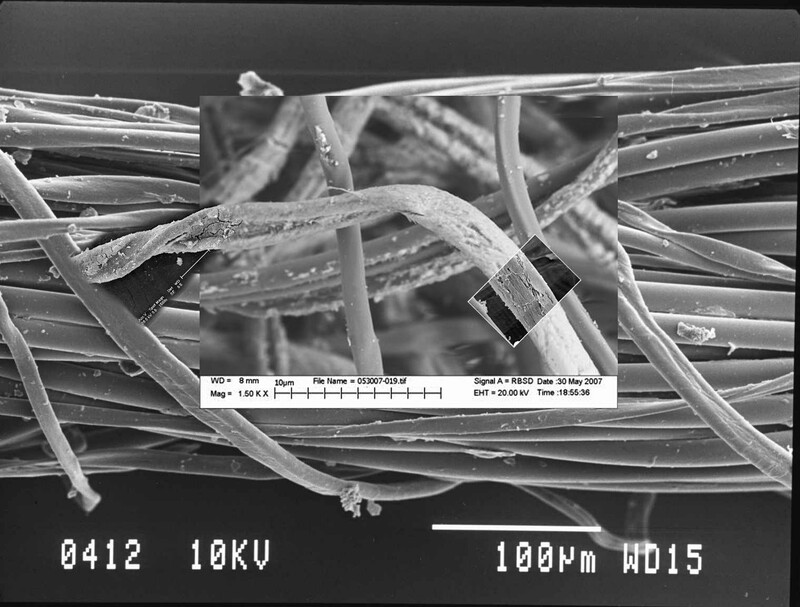 These “Morgellons” fibers are clearly cotton. Agrobacterium infections in humans: experience at one hospital and review. Agrobacteria are noted primarily for their phytopathogenicity [infecting plants] and when isolated from human clinical specimens are often considered contaminants or organisms of low pathogenicity [infecting humans]. We report six cases at one hospital over a 6 1/2-year period in which infection was accompanied by a compatible clinical syndrome and review 19 cases reported in the literature. Fourteen of the 25 combined cases involved central venous catheter-associated infections. Six cases involved peritonitis, five of which occurred in patients undergoing continuous ambulatory peritoneal dialysis. Additional infections included two non-catheter-associated bacteremias, one prosthetic valve endocarditis, and two urinary tract infections. Most infections were community acquired, and restriction enzyme analysis of Agrobacterium isolates from eight patients at one hospital revealed unique patterns in each case without evidence for clonal dissemination of these strains. Agrobacterium isolates may be resistant to multiple antibiotics, and optimal therapy has not yet been determined. Agrobacteria should be recognized as opportunistic pathogens in the immunocompromised host, particularly in those with indwelling plastic catheters. So, several sick patients from Stricker’s patient community, who probably had indwelling plastic catheters, tested positive for Agrobacterium, and found cotton in their wounds.